Today, forums constitute an integral part of almost all online courses in teacher education colleges. In many of these courses the forum serves for sharing opinions, attitudes, and feelings by the learners rather than for scaffolding cognitive processes. The forum in the “Human Biology and Health” course for prospective elementary-school science teachers was intended to engage exclusively with the subjects studied, thus becoming a “substance oriented” forum. This was achieved by providing the students with instructions for composing messages, which in turn, helped them to construct their own knowledge while learning the subject matter. Content analysis of the students' discourse in the forum revealed good comprehension of the subjects studied, although higher levels of cognitive skills expressed by reflection were only partially achieved. The findings show that by designing appropriate learning assignments for the forum its potential to augment understanding of content as well as to facilitate peer learning by mutual assistance can be realized. Eilon, B. & Kliachko, S. (2004). The Contribution of a Substance-Oriented Forum to the Study of Human Biology in Science Teacher Education. 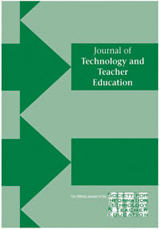 Journal of Technology and Teacher Education, 12 (1), 5-24. Norfolk, VA: Society for Information Technology & Teacher Education. Retrieved April 23, 2019 from https://www.learntechlib.org/primary/p/14632/. Dey, I. (1993). Qualitative data analysis. London: Routledge. Harasim, L. (1989). Online education: A new domain. In R. Mason& A.
Henri, F. (1992). Computer conferencing and content analysis. In A. Kaye (Ed.) , Collaborative learning through computer conferencing (pp. 117136). Heidelberg, Germany: Springer-Verlag. Kaye, A. (1989). Computer mediated communication and distance learning. In R. Mason& A. Kay (Eds.) , M indweave: Communication, computers and distance education (pp. 3-21). Oxford, UK: Pergamon Press. Mason, R. (1992). Evaluation methodologies for evaluating applications of computer conferencing. In A. Kaye (Ed.) , Collaborative learning through computer conferencing (pp. 105-116). Heidelberg, Germany: Springer-Verlag. McKernan , J. (1991). Curriculum action research. New York: St. Martin’s Press. McNiff, J. (1991). Action research: Principles and practice (2nd ed.). London& New York: Routledge.